Our second day in Valley of Fire was mostly an easy stroll through the park, unlike the more challenging scrambling we'd encountered the previous day. Eric and Steve wanted something less demanding and my job was to deliver it. I had gotten up early again to do a climb while the others were taking their timing waking and breakfasting. Officially unnamed Surprise Peak is found in Purcell's Rambles & Scrambles, same as all of today's peaks. It is located in the Muddy Mountains, a limestone range found south of Valley of Fire Hwy, about a 40min drive from where we were camped. There is an interesting sandstone area near the peak called Buffington Pocket and it was to this I steered the jeep, parking in the middle of it when the road ended, less than half a mile from the summit. The peak lies to the west of the main crest, making for a relatively easy climb with modest gain, taking all of 20min. I found no register but left one I was carrying with me, before returning via a slight alternative. It wasn't even 8a by the time I returned to the jeep and by 8:30a I was back at camp, suspecting it could be the only peak of the day. Once again it took quite a bit of time for the others to get breakfast finished and find our way to the park. We stopped for a short hike around the petrified logs found at the west end of the park, making a loop through the 6-7 specimens. These were much better than the sole log found at the east end of the park that I'd seen on a previous visit. 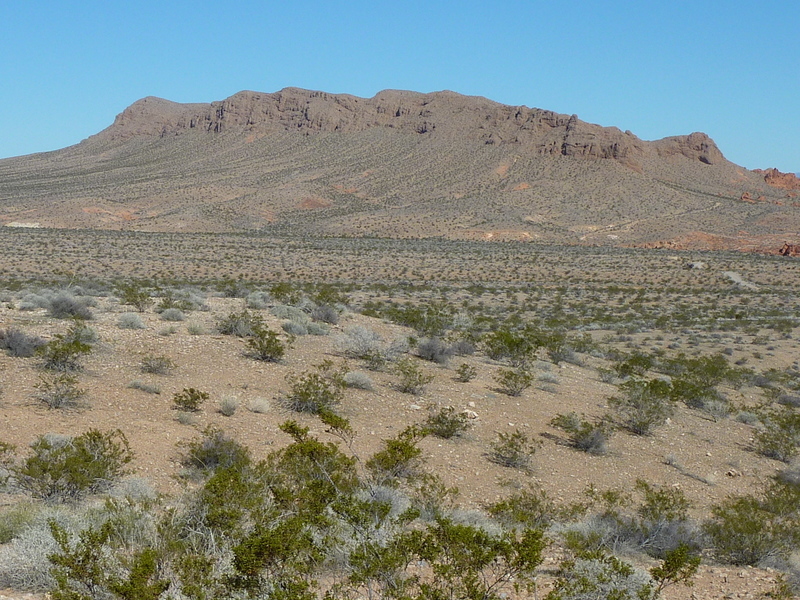 It wasn't until after 10a before we were heading out from the south end of the Prospect Trail, heading north towards a gap between Duane Peak on the left and Valley of Fire Peak on the right. The easy trail starts from near the campground on an old dirt road, eventually becoming a narrower, well-marked trail. I was amused (and a little annoyed) by the sign at the start of the trail reminding us that an enjoyable walk in the park becomes a citeable trespassing offense once the sun goes down. A mile and half into our walk I spotted what looked like a bird of prey perched on a sandstone pinnacle in the distance. There was much discussion about it, mostly trying to get Steve to see what Eric had readily spotted. Eventually we got a bit too close for its liking and it took off, at which time we could identify it as a red-tailed hawk. Where the trail reaches its highest point at a low saddle, I told the others I was going to head up to the ridgeline on our left (west) to visit Duane Peak, still about a mile away. Knowing they were wanting an easier outing, I was not expecting them to join me and figured we'd arrange a meeting place for a few hours later. Steve was quick to dismiss joining me, but Eric was starting to think otherwise. The slope I had pointed at seemed much to steep, so he asked me where the summit was. I pointed to the peak in the distance, near the end of a longish ridgeline. Eric wondered if it might not be easier to avoid the ridge and head to the summit more directly. "Sure, that'll work," I offered as I turned to head up to the ridge anyway, "I'll meet you there." Not wanting to be left alone, Steve decided to join Eric on what they thought would be an easier route. They started over what seemed to be desert flats but soon realized that there were quite a few non-trivial dips into various drainages along the way. A herd of bighorn sheep was rousted out of one such drainage, taking off to the east as we all turned upon hearing the thundering noise. Steve counted nine in all as they quickly disappeared out of sight. Eric and Steve continued on their track only a short distance before thinking maybe it was more work than they bargained for. As they paused to consider turning back, Leroy spotted me up on the ridge and charged uphill to join me in short order. Eric called to Leroy to come back down, but he would have none of it. Leroy liked being out in front on our hikes and he'd come to associate me with being in front, too. If he was with Bob, the others were sure to follow. No amount of coaxing on my end could get Leroy to go back down the hill, even though I changed direction and started down the ridge. Steve was the first to make it up to the ridge, Eric only slowly joining us and not looking like he was having much fun when he finally did. After a much-needed rest, we all got up to continue to the summit less than half a mile away now. This, they realized, was a much better way to go compared to the gullies below. The ridgeline was a bit undulating, but no more steep slopes and the views across the landscape were quite nice. We spent about 30min along the ridge, eventually reaching the highpoint at the northwest end. We left a register while taking a longer break at the summit, eventually packing up our stuff and heading back down after about half an hour. I led us east off Duane, aiming for a pastel-colored area of sandstone at the base of the darker brown/orange sandstone of Valley of Fire Peak. The same herd of Bighorn spotted us a second time from afar, this time heading north to put more space between us. The colorful sandstone was an interesting area with hundreds of layers of sandstone, some only a quarter inch thick, overlapping each other. We went down through some twisty canyons, past some tenajas filled with water from recent rains, eventually intersecting the Prospect Trail we'd started on earlier. We then turned to follow the trail south back out to where we'd started, enjoying the sandstone features along the way as we took our time for much of this last hour. It was nearly 3p by the time we'd finished up, but a little too soon to call it a day. I convinced the others to throw me a bone and allow me to climb one last summit while they took it easy. The two closest spots for this summit are at Mouse's Tank and Rainbow Vista, the first southwest and the second northwest of the summit. There were too many folks at both sites for their liking, so in order to give them a more isolated place to hang out, we drove partway along the spur road to Silica Dome, about 0.4mi north of the summit. I took off while they were still deciding where to relax at, figuring I might be at the summit and back before they'd sorted it out. The going was easy at first, crossing the Rainbow Vista Trail to Valley of Fire Canyon at the halfway point, after which things got a bit harder. There were some route-finding challenges to find my way up the northeast side, but it all goes at class 3 or less, and in 17min I had found my way to the top. I paid a visit to its three cairns, finding the highpoint at the westernmost one. I found no register at any of the cairns and left none before trying to find my way down an alternate route on the southeast side. I made good progress until the final 20ft into the wash below and eventually, after several more dead ends, had to climb back up to the summit and go back down the way I'd ascended. As I was hiking through the easier terrain near the end, I spotted the two of them on a ledge high above me. I decided to backtrack before they spotted me and try to reach them from behind without being spotted. I got within about 10ft of them undetected, but they were sitting facing different directions which kept me from getting even closer. They'd had a bit to smoke in my absence while enjoying the fine views their perch afforded as the sun began settling in the western sky. Having partaken perhaps a bit too much, Steve had some trouble when it was time to leave. Leroy helped gather up Steve's belongings and escorted him back to the car, luckily not all that far away.